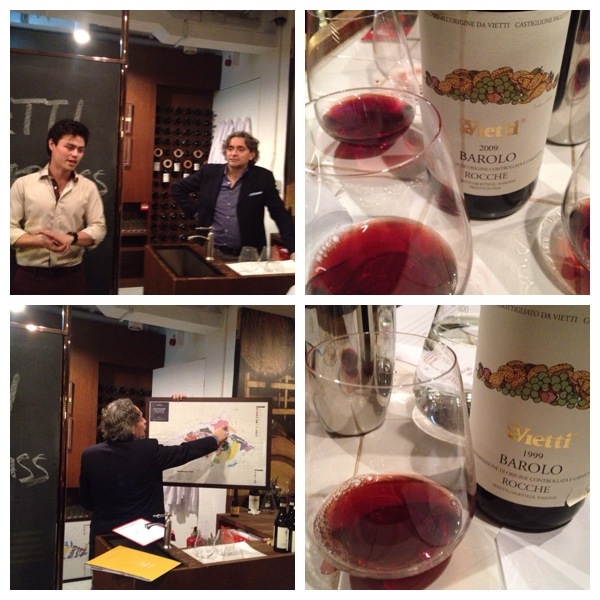 On Friday I went to the Veitti Masterclass at The Flying Winemaker hosted by Luca Currado. What an outstanding evening! From the very beginning, Luca’s sense of humour and personality set the tone for what was to be a highly entertaining and informative event. The estate can trace its lineage as far back as the 17th century in the historic Barolo region. Understandably this brings with it a deep sense of responsibility and humility as Luca explained – “we are so lucky to have these incredible varieties and this incredible landscape that is so unique”. As a young winemaker Luca didn’t rest on the laurels of his family’s reputation and spent time working in Burgundy, Bordeaux and California before returning to the family estate. Eager to prove himself, as he tells the story, he requested a parcel of Barolo Grand Cru from his father and set about replanting it. The subsequent cuttings that arrived were not Nebbiolo but Barbera – much to the surprise of Luca and the consternation of the village. One simply did not plant Barbera in Barolo Grand Cru! As luck would have it (or so Luca says, but I would suggest that his talent and skills had a bigger part in it) the Barbera was highly successful, gathering critical acclaim and launching the young winemaker on his way. During the evening, we tasted six wines. Although difficult to choose, the 2010 “Perbacco” and the 1999 Barolo Rocche were the standouts for me. “Perbacco”, an old Italian phrase meaning “wow, what a (pleasant) surprise”, sums up this wine well. The wine was very approachable given its youth with flavours of sour cherry, red liquorice and violets framed by the characteristic high acid and tannin structure of Nebbiolo. This wine would be the perfect accompaniment to a hearty meat stew or some lovely rich cheese pasta. At the other end of the spectrum, the 1999 Barolo Rocche was the wine I did not want to disappear from my glass. It was delicious and was the perfect example of how with each sniff and each taste the wine evolved in the glass. Cooked plums and leather moved into savoury and floral notes of charcuterie and violets. On the palate sour cherries, liquorice, tobacco, coffee and a hint of tar. This was a complex and sophisticated wine that delivered on both the nose and the palate. The 1999 Vietti Barolo Rocche was an extraordinary wine that should you be lucky enough to try I am sure you would enjoy! If you can’t get your hands on the 1999, any of the Vietti wines are bound to satisfy with the Nebbiolo “Perbacco” being excellent value for money. And with labels that are commissioned by an artist for each vintage you have a perfect conversation starter for your dinner!